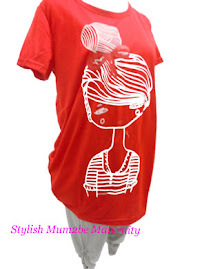 If you are interested to purchase our maternity wear but would like to try out on our clothes first, you are warmly welcome to visit our maternity showroom in Ang Mo Kio. Of course, there is no obligation to purchase if you do not find any item suitable for you. In addition, you enjoy the same discounts and savings, as on our website, for showroom purchases. 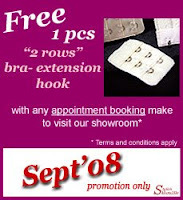 All visitors who made a pre-booking in advance within the Appointment Time Slots (in Sept'08) to visit our maternity showroom are entitled to get a piece of “2-rows bra-extension hook” (worth $2.90) absolutely free*. Promotion valid while stocks last so enquire us at xiaoling@sgtrust.net now. - Pre-booking of at least one day in advance is required. - All pre-booking must be made in reference from our Appointment Time-Slots. - Strictly for one redemption per customer. - The promotion item is redeemable at the showroom for visitor who turns up on the pre-booking appointment time slots in September’08.